Can't be ars'd to write it all again so full story on the blog. Nice table Brian, you have turned a pile of crap into a very respectable table . Reading your blog I noticed you mention of Ron Carter, he was a really nice guy and a superb designer, I made the Miles Carter prototypes before I joined them as production manager in Wirksworth. Thanks both, I didn't know you hailed from Wirksworth Paul! It's a nice little table there Brian. Understated and clean, and I like the way the eye is deceived somewhat by some of the curves. What I mean is that, looking at the final photograph in your blog for instance, the stretchers seem to curve inwards, as if following the curve of the slatted top, whereas I'm pretty sure they only curve upwards. Whether it was intended or not, it's something that catches my eye and is visually appealing. I found your comment about cleaning off dried polyurethane glue interesting because I've generally found it one of the easiest glues to remove, not troublesome. I seldom use polyurethane glue for indoor furniture because I've found it more likely to fail than other glues. But for wet or air dried wood that's going to go outside as a finished artefact (furniture or whatever) it's just about the only glue that will stick together joints made out of wood that's more than 20% MC. Just about every other glue is designed for use on dry wood, which of course, by definition, means wood that's below 20% MC. Slainte. PS. Thanks for the kind words in my tambour making thread. I guess you were happy to see a piece of mine that didn't have the much derided "carthorse" legs on it, but I still like them and may well use them again, ha, ha. sgiandubh wrote: It's a nice little table there Brian. Understated and clean, and I like the way the eye is deceived somewhat by some of the curves. What I mean is that, looking at the final photograph in your blog for instance, the stretchers seem to curve inwards, as if following the curve of the slatted top, whereas I'm pretty sure they only curve upwards. Whether it was intended or not, it's something that catches my eye and is visually appealing. They do only curve upwards, the idea was probably a relic of some scandi modern design book but I thought it would be a good idea if the rails left the legs at right angles. Re the glue, maybe I should buy a bottle of acetone. It certainly seems to stick OK.
Re the tambour cupboard, I confess it did cross my mind, but I love the rainbow front; stunning. 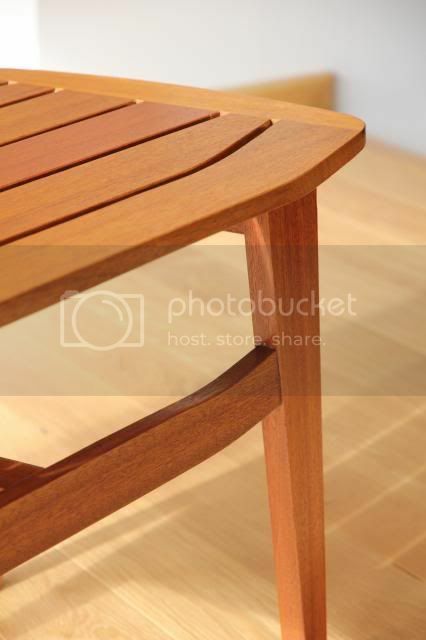 Lovely piece of furniture - your blog is also very good.